he final bell. Yesterday saw another mass murder in a Florida high school, and the result was renewed terror at school drop-off this morning. 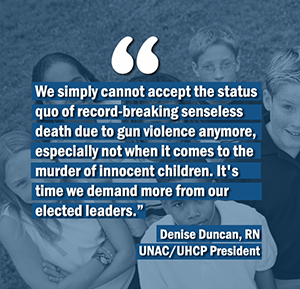 We simply cannot accept the status quo of record-breaking senseless death due to gun violence anymore, especially not when it comes to the murder of innocent children. “In just 35 days this year, gun violence occurred on school grounds in America 18 times, according to Everytown for Gun Safety. Many Americans now worry about going to church, work, a concert or school, as we see evidence on the news every week that we are not safe in public spaces. Late last year, a disturbed man walked into a church in Texas and opened fire, killing 26 and wounding 20. This deadly shooting in a safe space rocked our country—and yesterday’s deadly murderous rampage at a school must force us into action. “Some will tell you that gun violence is preventable with armed guards in our churches and schools. Nothing could be further from the truth. Controlling the sale of guns and banning semi and fully automatic rifles will prevent gun massacres. Arming even more people is part of the problem, not the solution. “In 1996, Australia elected leaders were at a crossroads after a gunman wielding a semi-automatic rifle killed 35 and injured 23 in the Port Arthur massacre at a popular tourist attraction. Following the tragedy, the Australian Prime Minister introduced strict gun laws that prevented private ownership of automatic and semi-automatic firearms, including a mandatory buyback of banned guns. These laws were passed with bipartisan support. In 2002, Australia passed stronger gun control laws for sport-shooting handguns. The result? A 20% decline in homicides in the first decade. That number has continued to drop. Since the 1996 law, no gun massacres have occurred in the country. “Australia has not banned all guns. But they have banned the most deadly guns. We can do the same. Many legislators who claim to keep the victims of gun violence in their prayers have blocked attempts to put into place commonsense gun control laws. As Americans, it’s time for us to think and pray about this issue too—and then vote out legislators who will not put our families’ safety above special gun lobby interests. United Nurses Associations of California/Union of Health Care Professionals (UNAC/UHCP) represents over 30,000 registered nurses and other health care professionals, including optometrists; pharmacists; physical, occupational and speech therapists; case managers; nurse midwives; social workers; clinical lab scientists; physician assistants and nurse practitioners. UNAC/UHCP is affiliated with the National Union of Hospital and Health Care Employees and the American Federation of State, County and Municipal Employees, AFL-CIO. More information available by clicking here. Read the statement on the UNAC/UHCP Facebook page.